Our brand new 18" magnetic double bar holders are constructed by stainless steel and guarantees to keep all of your knives in place! Use it not only for kitchen but for garage, art room, office, craft workshop or garden shed storage and even just outdoors. You can hanging large wrench, scissors and other accessory. Install it easily and effortlessly! Includes all necessary mounting screws w/ hardware and detailed instructions for easy DIY installation. You can mount it vertical or horizontal, on wall or on tile - this does not affect the functionality. Immediately after mounted this powerful multi-purpose storage it will keep all of your knives in order and prevent from dulling! 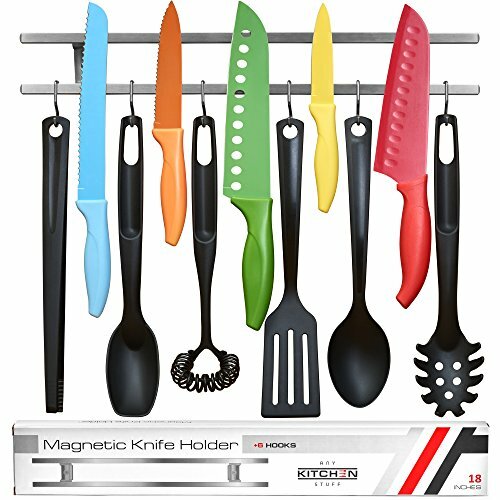 Our product is constructed by a best and durable neodymium magnet, so as to hold as many utensils as possible! We guarantee that our strip is constructed by a heavy-duty magnet that will keep your Chef's knives, Butcher knives, Steak knives, Cleavers, Bread knives, Carving knives and any other kitchen cutlery you may have safety in place! 6 extra hooks are included - hang more kitchen stuff on this best utensil hanger and providing easy access to all of them! You can use 1 hook or all 6 hooks based on your needs. Our professional magnetic knife strip guarantees your children's safety and yours at the same time by keeping all of your knives placed in order on the backsplash! Press ADD TO CART and consider getting couple: one for kitchen, one for garage and one for your friends as a gift! Just use code ITAKEFEW to get a discount. SUPER STRONG NEODYMIUM MAGNETS that will hold all even your heaviest knife and will never lose their magnetic force. USE HOOKS AND MAKE YOUR KITCHEN SPACE LOOK LIKE A PROFESSIONAL'S: 6 additional hooks for your gadgets allow saving even more space with same way chefs does. SAVE TIME AND EFFORT: Get your favorite knife within seconds without having to open every single drawer in order to find it! Save time by stop sharpening your knives - without touch other utensils they will remain cutting edge sharpened! SAFETY LIKE NEVER BEFORE: All of your utensils will be safely kept in safety place out of reach of children! Also old style knife blocks and drawer insert are often keep germs and mold from damp wood! This magnetic knife holder allows each knife to stay clean edged, sharp, and dry. STORE YOUR COOKING UTENSILS LIKE A CHEF OR GET A REFUND - if for whatever reason you don't absolutely love your new holder we'll refund you money or replace it if there is an issue. If you have any questions about this product by Any Kitchen Stuff, contact us by completing and submitting the form below. If you are looking for a specif part number, please include it with your message.